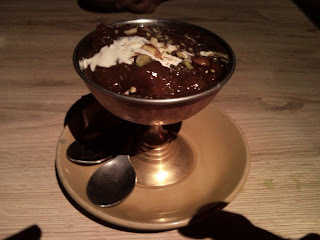 Bangalore restaurants- Food and Travel: Gufha - no caveman's food this!! Gufha - no caveman's food this!! Sudhakar and I need the smallest of excuses to go out and celebrate. We did have a small reason yesterday and that's when we decided to implement our new resolution. With the rains dampening most spirits and wreaking havoc with traffic, we have decided to explore restaurants closer to home - Jayanagar. And so we started with Gufha - one of the restaurants attached to the President Hotel in 3rd block. The first time we came here was around a year and half ago. True to the name the restaurant interiors are done up to resemble that of a cave. Once you step out of the lift, the lighting completely dims and all that you have illuminating your way are lanterns. You are ushered in by a man dressed in a tribal outfit - tiger stripes, spear, feathered head gear and all. It is quite funny though when he greets you in the Queen's English. The waiters here are dressed not in suits but in Shikari Shambu outfits (though not funny looking, I couldn't think of a better comparison). Despite it being a weekday, the place was packed and in a little while it became apparent that making a reservation in the future would be a wise idea. We finally settled down at a corner table right under a jungle vine with a larger than life scorpion. No background music here, rather you are treated to the sounds of the night creatures of the jungle. For starters we ordered the Aloo Churmuri and the Afghani Murgh. Sudhakar decided to have a cocktail named WildFire which was supposedly a combination of beer, tequila and peach schnappes. 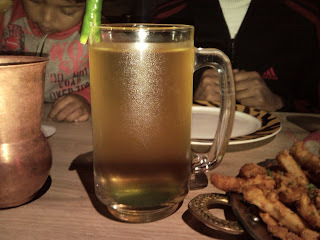 Since there was supposed to be beer in the drink, I expected it to have some fizz, but the drink was flat and came garnished with a half sliced green chilli. While you could taste the tequila, there was no sign of peach schnappes. Instead a distinctly blue tinge at the base of the glass made us suspect that there was a hint of Blue Curacao instead. Not a drink to remember though. The menu described the Aloo Churmuri as shredded potatoes deep fried. My concept of shredded is not finger chips. 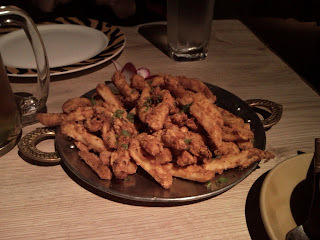 What came was french fries, coated with a chilli batter and fried. Nice, but not especially so. The Afghani Murgh was quite interesting. 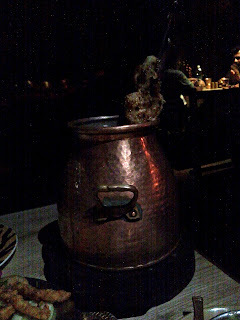 Succulent pieces of boneless chicken on two skewers was brought in a brass matka. The skewers were lodged in a bed of embers. The resultant smoky flavour along with the coriander yoghurt chutney was superlative. Afghani Murgh - what a presentation! For the main course we ordered the Nalli Ka Ghosht which was described as lamb marrow marinated in yellow chilli paste, ginger and garlic and yoghurt and cooked in spices. I love marrow and the child in me expected the dish to come with only bits of soft marrow. What came instead was several pieces of marrow bones, full to the brim with juicy marrow and meat on the bone (which is often a rarity). 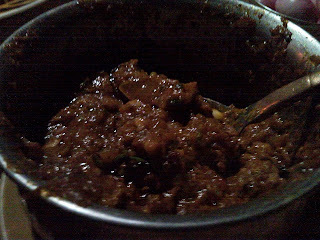 The masala was great with ginger being the over powering flavour. This dish went great with the Afghani roti I ordered which was a thickish roti garnished with sesame and onion seeds. Despite being thick, the roti had a soft texture. Sudhakar had a garlic stuffed kulcha which was good. For dessert we decided to split a Qubani Ka Meeta. Now this was truly amazing. The apricots, which were aplenty for the bowl were soft and soaking in just the right amount of sweetness. The cream that is traditionally added on top only heightened the flavour. Overall the food is good, but remember never to go by the descriptions in the menu, they tend to mislead. Service is good and you are constantly asked if you have enjoyed the food. The staff is not really used to being given a feedback and looked pretty zapped when we said the drink had Blue Curacao instead of peach schnappes. The toilets are neat and clean. Oh! and a warning for parents. Small children might tend to scare a bit at the ambience. The lights are really dim and the background sounds of night creatures can spook them. Quite a few kids in the restaurant were hanging for dear life, mine included. 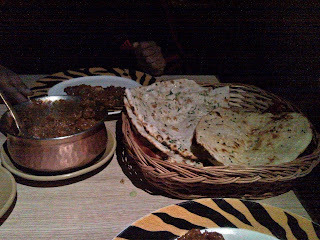 This meal cost us around Rs 1200 which I felt was slightly steep for the fare. Sorry for the photos... the light was really low.